All our kiln dried logs Abingdon deliveries are free. We also offer our high quality logs with free delivery to the villages around Abingdon including Drayton, Sutton Courtenay, Steventon, Appleford, Marcham, Wootton and Boars Hill. For exact details of our free delivery area see the map on our order page. If you think you are outside this area please get in touch. Our delivery is competitively priced and we may be able to combine deliveries minimising costs. 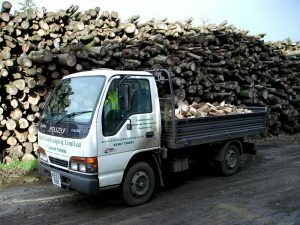 Our logs are Kiln dried (the kiln uses scrap timber from our log processing). They are then barn stored to keep them within a 10 -15% moisture level, ensuring they reach you in the best condition to burn. Because they are Kiln dried, you are paying for timber, not water. They will burn cleaner and provide a higher heat output than air dried logs. We only sell the highest quality Beech and Ash, sustainably sourced and local where possible. Kiln Dried Logs Abingdon. Now in stock for immediate delivery - ORDER NOW! Ford Landscaping provides a reliable and expert service in all aspects of private garden landscape maintenance and construction & business grounds maintenance. We are based in Oxfordshire and cover Oxford, Abingdon, Wantage and Faringdon.